The Quantified Self (aka “QS”) is an informal San Francisco based group of people who are tracking one thing or another about their lives. (Could it exist anywhere else??) They have occasional “Show&Tell” meet-ups, with elbow-rubbing and a series of quick talks, 10-15 minutes each. A few weeks ago I was in town for a talk at the northern California chapter of HIMSS on personal health records. Matthew Holt of Health 2.0 and The Health Care Blog told me QS was meeting that Monday, at the headquarters of Wired magazine. I registered, and at the end it asked “You wanna present?” I never say no to that, though I didn’t know what I’d talk about. This is an informal production – audio from a camcorder (no mic) blended with my slides and a few other images. It was fun: a responsive, engaged audience. Thanks to the QS gang for the opportunity. QS is a project of Wired‘s Gary Isaac Wolf (Associate Editor) and Kevin Kelly (Founding Executive Editor). “KK,” as he’s known, is also on the advisory board of our Journal of Participatory Medicine. Spectacular human and entrepreneur Esther Dyson, also on JoPM’s advisory board. I’ve just returned from Toronto, where I gave the opening keynote at the Medicine 2.0 Congress. 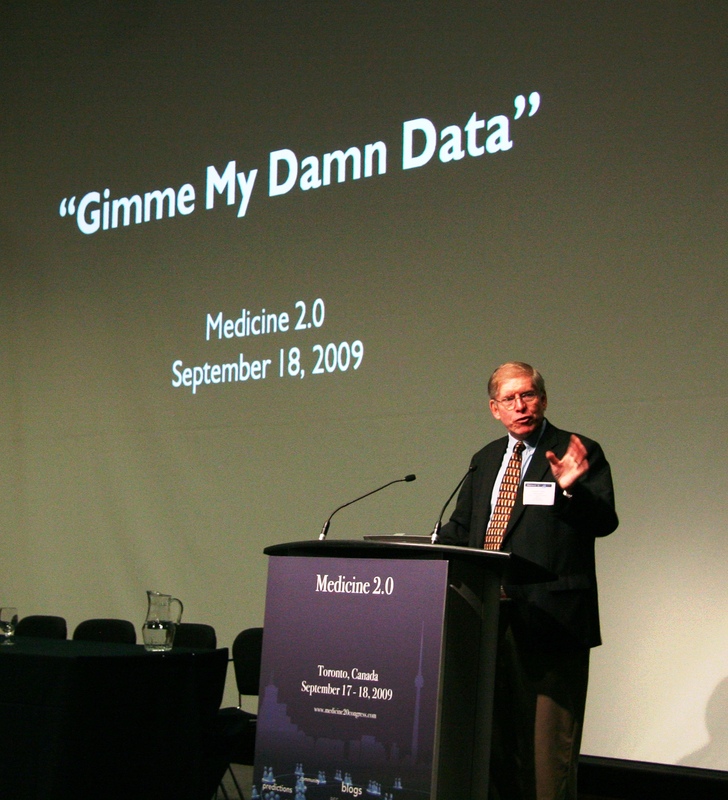 It was titled “Gimme My Damn Data,” which is an unconventional title for an opening address, but I meant it. Here’s why. A new world of participatory medicine has been growing for years, largely unnoticed. In this new world, healthcare is not a one-way street: empowered patients are engaged in their care, actively collaborating with their physicians, sharing responsibility for their care. The providers (doctors, nurses, etc) are still the providers, but the patients share in both the knowledge and the responsibility for how it all turns out. And, certainly, the decision making. This requires that patients have access to their medical data. (Whose data is it, anyway?) As my primary physician Danny Sands, MD MPH, says, “How can patients participate if they can’t see the data?” But in today’s world (America and, I’m told, many other countries), access to our health data is anything but easy. In the USA the HIPAA act guarantees that we can get it – but it can take months, which is absurd in a crisis. And, law or no law, Deven McGraw of the Center for Democracy and Technology reports that problems with data access are the #5 complaint #3 HIPAA complaint* reported to the Department of Health and Human Services. Some providers are great about this. My own medical records, which I can read anytime, are on PatientSite at Beth Israel Deaconess. But there’s still no way for me to get all the data out: I can export some information, but not all. And my hospital’s much better than most: most have no way at all to give you your data – except by fax machine. There are many technical issues to be ironed out, not the least of which is what format the data should be in. I want to participate in projects to make something happen in this area, something all citizens can get their hands on. If you’d like to partner with me on such a project, contact me. My slides from the talk should be online within a few days. I’m glad to say that my talk was well received, but to a certain extent I was preaching to the choir. We have much work to do. So yeah, I meant it: give us our data, and I meant it strongly. No kidding: unleash our data! It’ll take time. Let’s get to work. I do this with some trepidation, because the slides are not the talk, they’re just the visual aids. But so many people have asked, I’m posting just the slides.